America’s principals understand the importance of social-emotional learning but aren’t certain how they should measure it, how to implement it successfully in a classroom, or how to prepare their educators to teach it. That’s according to a new survey of K-12 principals from the Collaborative for Academic, Social, and Emotional Learning. Amid growing research showing the benefits of social-emotional learning for student well-being, graduation rates, and academics, the survey reveals what educators still need to do to make SEL work within schools. While most principals believe that social-emotional skills should be measured, only 17 percent reported knowing which assessments they could use. Only one-quarter of principals are using the assessments for all their students. But many principals are still skeptical that assessments are helpful. Only 40 percent reported their tests as very or fairly useful, and only 16 percent think their teachers know how to use the assessment data to help their students. The survey findings weren’t surprising to Karen Niemi, CEO of CASEL, who has seen a shift in social-emotional learning work over the years, from trying to prove its importance in schools to now trying to figure out the best way to implement and measure it. “This principals survey confirms that shift, not on the why, but the how. How do you actually do it? That’s something we’re working really hard on,” she told The 74. Created for CASEL, the survey comes from Civic Enterprises with Hart Research Associates and was conducted online in February and March 2017. It includes a nationally representative sample of 884 public school principals. The margin of error is plus or minus 3.4 percentage points, though higher for subgroups. CASEL has been working on ways to effectively measure social-emotional skills with a design challenge the organization hosted. However, there are many barriers to successful measurement, including not having a consistent definition of SEL and trying to find programs that can scale across America’s diverse districts. The challenge of assessing social-emotional skills came up as states debated what to include in their federal accountability plans as a fifth indicator, or a nonacademic skill for measuring student success, under the Every Student Succeeds Act. Many states chose something other than SEL, partly because of fears over corruptibility of data and difficulties measuring it. 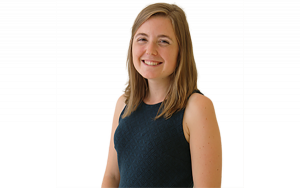 “We are of the position right now that the appropriate role of assessment is not for accountability purposes, but to help improve instruction,” Niemi said. 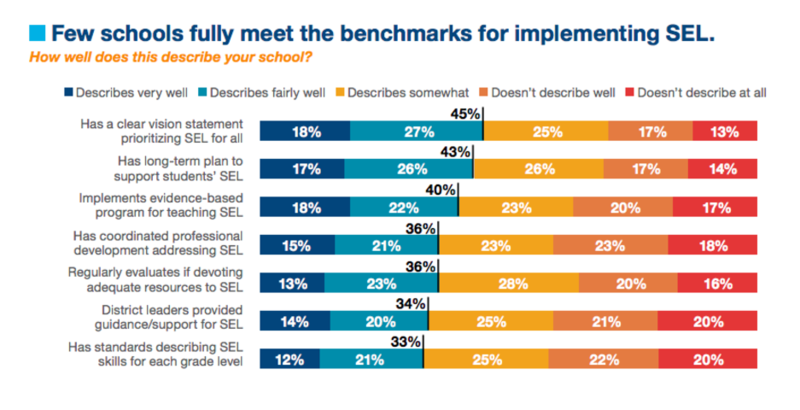 While 95 percent of principals said they are committed to cultivating SEL skills in their students, only one-third have plans to implement SEL across their entire school, and only 38 percent have plans to implement it for some students. Few schools are implementing social-emotional learning sufficiently across their schools, according to benchmarks set by CASEL. For example, only one-third of principals reported that their school describes SEL skills for each grade level, that district leaders provide support for SEL, and that there is professional development around these skills. “There’s an elevated sense of urgency about developing a plan for SEL without a lot of expertise on how to do it,” Niemi said. 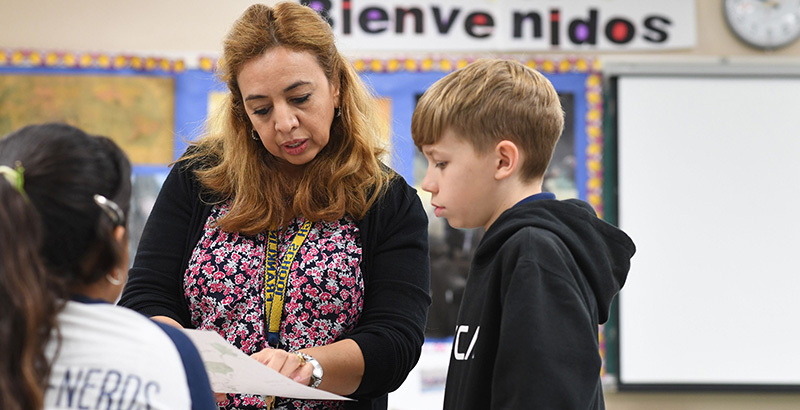 Teachers don’t have enough time to implement SEL in the classroom, principals said, highlighting that as the biggest barrier in increasing SEL, followed by a lack of funding. And less than half of principals think their teachers are prepared to do the work. Still, 70 percent of principals said they expect their teachers to instruct students to be socially and emotionally competent. The report recommends more professional development to help fill this gap. Teachers say they want more support when it comes to SEL. According to a similar survey conducted by CASEL of teachers in 2013, 82 percent said they were interested in receiving this training.